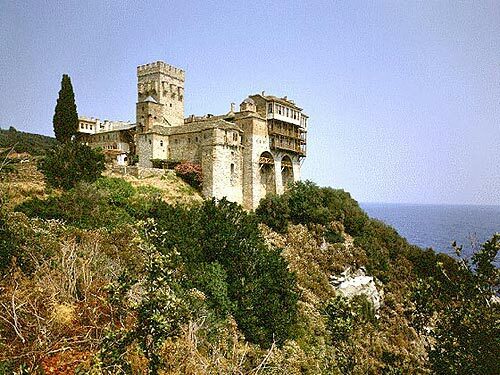 On Mount Athos is in a monastery which is called Stavronikita which is dedicated to St. Nicholas. The monastery however was originally built in memory of St. John the Baptist. In the Iconoclast period, the monks threw many icons into the sea so they might not be contaminated by the hands of the Iconoclasts. 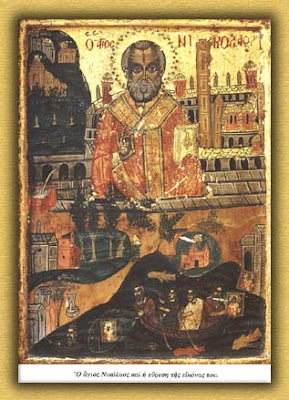 One of those icons was of St. Nicholas, which is currently in the monastery of Stavroniketa and is one of the miraculous icons of Mount Athos. Following the burning of the monastery by the Corsairs, the Patriarch, Jeremiah the Elder, sought to rebuild it in the name of St. John the Baptist. And while construction was started, the monks were throwing nets into the sea to catch a few fish. But when they pulled up their nets, they found within them the miraculous icon of St. Nicholas. 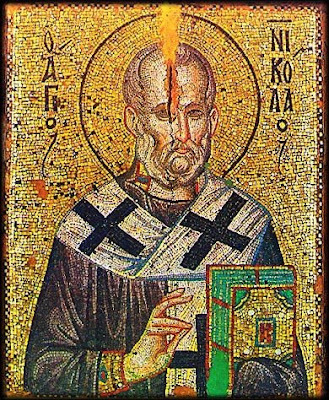 In the icon (in the face of St. Nicholas) an oyster was stuck and imbedded. When they pulled they oyster out of the icon, they were shocked. Blood ran from the wound opened by the oyster! Because of this miracle, the icon was named Agios Nikolaos o “Streidas”. And the name remains to this day. The icon is very old. It was not made by painting, but is a mosaic (such as those in Hagia Sophia, Daphne, St. Demetrios in Thessaloniki, etc.) But such small icons on wood are rare. On the old Proskenetarion [veneration stand which held the icon] on Mount Athos, the following is stated about the icon of the Saint: «This icon came from the sea, because it was thrown therein at the time of Iconoclasm and because of the long time it was in the sea, an oyster was embedded in the forehead, and ostreidas was how it was called, and is guilded beautifully in gold leaf?». [«είναι δε μετά μωσίου ψηφίδων χρυσών η ιεροιστορία εγκεκοσμημένη εις κάλλος»] When the Patriarch saw the miracle of this icon, he dedicated the new monastery which was being built to St. Nicholas, and not the Forerunner. One half of the shell of an oyster the Patriarch used as a disc for the elevation of the Virgin, on the Holy Altar, the other did was made into an engolpion [rounded jewelry worn by bishops with an icon of the Theotokos on it, they were once used to hold Holy Communion] and is now in the sacristy of the Patriarchate of Moscow. This miracle happened in 1553 AD. Icon showing the finding of the Holy Icon of St. Nicholas "O Streidas" and the Monastery of Stavronikita (I don't remember where I found it online). "The Holy Monastery of Stavroniketa is the smallest in size on the Holy Mountain. It is on the eastern side of the peninsula between the Monasteries of Iveron and Pantocrator, looking towards the Strymonic Gulf. Its history, like that of the other monasteries, has been a turbulent one. In the course of its history, the Monastery has suffered five times from fires - in 1607 a large part of its buildings was reduced to ashes. In the 17th century, Serban Kantakouzinos, Prince of Wallachia, provided the Monastery with a water supply. In the next century, Alexandros Ghikas, also Prince of Wallachia, proved a its benefactor by presenting it with the Monastery of the Holy Apostles in Bucharest. The Monastery was burnt down again in 1741, 1864, 1874, and 1879, the last of these fires being the most destructive. Like the other monasteries, Stavroniketa was brought to its knees by the excessive taxes which it had to pay to the Turks. Its debt was paid as the result of superhuman efforts on the part of the Abbot of the Vatopedi Monastery, Theophilos. The arrival of a new brotherhood in 1968 saw its conversion from an idiorrhythmic monastery into a coenobium. It holds fifteenth position in the hierarchy of the 20 monasteries. One of the most valued of the Monastery's treasures is the icon of St Nicholas known as 'Streidas', a work of the 13th - 14th century. Stavroniketa has in its possession 171 manuscripts and a large number of printed books. Of particular importance is a Psalter of the 12th century with gold lettering (parchment codex No. 46). Its dependencies consist of 33 kalyves in the settlement of Kapsala, and four kellia. The Monastery has four chapels and two outlying chapels. At present it has some 30 monks. The all-holy icon of the Hierarch, O Faithful let us fall before and cry out, who are emcompassed by many sins, hearken O Nicholas, Hierarch of the Lord, by your holy intercessions before the Lover-of-Man, deliver from all dangers, sorrow and corruption, and dangerous sicknesses.